It's easy to rejoice and find joy in the Lord when everything in our lives is going smoothly. However, it is even more important to rejoice during the difficult times. This type of rejoicing is much harder and requires a conscious decision on our part. We see an example of this in Habakkuk 3:17-18. Despite the difficulties Habakkuk was enduring, he chose to rejoice. After a list of the problems facing him, he boldly declares YET I will rejoice. He chose to rejoice despite those circumstances. I am striving to implement this lesson in my own life. Despite the big issues (the pain and heartbreak of a broken relationship & the fact that we are facing an upcoming transition with uncertain outcomes) and the little issues (the oven isn't working and the printer has an attitude) we are currently facing, I can (and will!) consciously choose to rejoice in the Lord, my Savior! There is so much to find joy in - a strong marriage, a beautiful home, a thriving teaching ministry - but ultimately joy comes from my salvation and relationship with Jesus Christ. 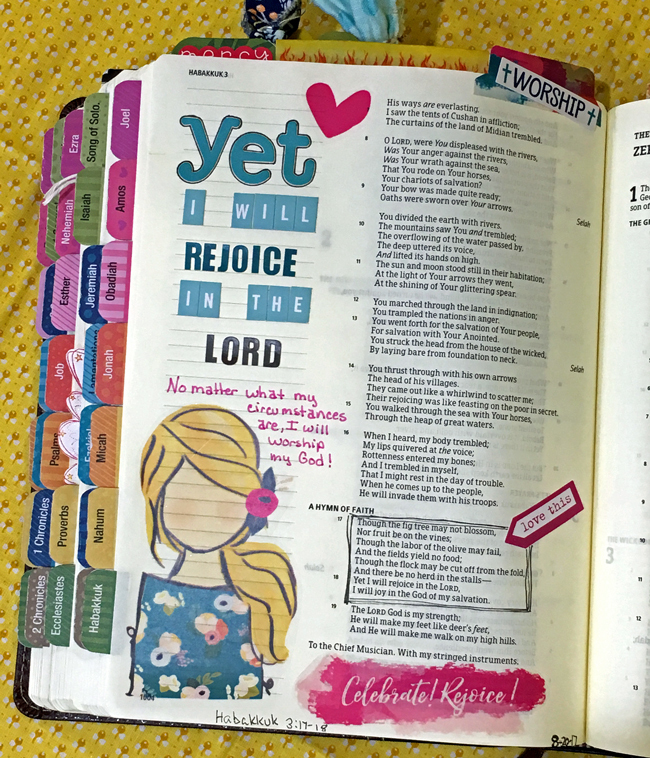 Do you find it hard to rejoice during the difficult times? I love that verse you highlighted. Who would have thought? In Habakkuk? Thanks for sharing.